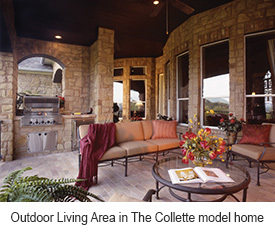 Austin, TX (March 27, 2015): Homebuyers who purchase a David Weekley to-be-built home in Austin can design it their way, for a limited time, in participating communities. During the program period, customers will receive up to $15,000 in design options from the David Weekley Homes Design Center in Austin. The home builder’s promotional campaign ends March 31. Design it Your Way lets homebuyers choose from thousands of Custom Choices™ to personalize their dream home. Design options include adding a bonus room, creating an outdoor living area or gourmet kitchen. Other selections include fixtures, flooring, cabinetry and countertops. Design it Your Way is not valid with any other offer or previously written contracts. Design selections must be made at the David Weekley Homes Design Center in Austin. For information about Design it Your Way or David Weekley homes in Austin, homebuyers may call 512-821-8818 or visit www.davidweekleyhomes.com.